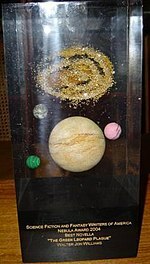 The Nebula Award for Best Short Story is a literary award assigned each year by the Science Fiction and Fantasy Writers of America (SFWA) for science fiction or fantasy short stories. A work of fiction is defined by the organization as a short story if it is less than 7,500 words; awards are also given out for longer works in the categories of novel, novella, and novelette. To be eligible for Nebula Award consideration a short story must be published in English in the United States. Works published in English elsewhere in the world are also eligible provided they are released on either a website or in an electronic edition. The Nebula Award for Best Short Story has been awarded annually since 1966. The award has been described as one of "the most important of the American science fiction awards" and "the science-fiction and fantasy equivalent" of the Emmy Awards. During the 54 nomination years, 220 authors have had works nominated; 40 of these have won, including co-authors. One of these authors, Lisa Tuttle, refused her award, and in 1971 no winner was chosen as "no award" received the highest number of votes. Harlan Ellison won three times out of eight nominations, both the highest number of wins and the highest number of nominations of any author. Ten authors have won twice, with Karen Joy Fowler at seven and Gardner Dozois at six having the next highest nomination count after Ellison. Michael Swanwick has the most nominations for short story without winning at six, and Howard Waldrop and Gene Wolfe are next with five each. No other author has been nominated more than four times. In the following table, the years correspond to the date of the ceremony, rather than when the short story was first published. Each year links to the corresponding "year in literature". Entries with a blue background and an asterisk (*) next to the writer's name have won the award; those with a white background are the other nominees on the shortlist. Entries with a gray background and a plus sign (+) mark a year when "no award" was selected as the winner. ^ Lisa Tuttle unsuccessfully attempted to withdraw "The Bone Flute" from the final ballot, and then refused the award when it won, because George Guthridge had sent copies of his story "The Quiet" to SFWA members in an attempt to solicit votes. The award was collected on her behalf by Pocket Books's editor John Douglas, and no mention of her refusal was made at the awards ceremony. ^ a b c d e f g h i j k l m n o p q r s t u v w x y z aa ab ac ad ae "Nebula Awards 1966". Science Fiction Awards Database. Locus. Archived from the original on 2015-10-24. Retrieved 2011-12-06. ^ a b c d e f "Nebula Awards 1968". Science Fiction Awards Database. Locus. Archived from the original on 2015-10-25. Retrieved 2011-12-06. ^ a b c d e f "Nebula Awards 1969". Science Fiction Awards Database. Locus. Archived from the original on 2015-10-25. Retrieved 2011-12-06. ^ a b c d e f g h "Nebula Awards 1971". Science Fiction Awards Database. Locus. Archived from the original on 2015-10-25. Retrieved 2011-12-06. ^ a b c d "Nebula Awards 1972". Science Fiction Awards Database. Locus. Archived from the original on 2015-10-25. Retrieved 2011-12-06. ^ a b c d e f "Nebula Awards 1974". Science Fiction Awards Database. Locus. Archived from the original on 2015-10-25. Retrieved 2011-12-06. ^ a b c d e f g h i j k l m "Nebula Awards 1976". Science Fiction Awards Database. Locus. Archived from the original on 2015-10-25. Retrieved 2011-12-06. ^ a b c d e f "Nebula Awards 1977". Science Fiction Awards Database. Locus. Archived from the original on 2015-10-25. Retrieved 2011-12-06. ^ a b c d e "Nebula Awards 1981". Science Fiction Awards Database. Locus. Archived from the original on 2015-10-25. Retrieved 2011-12-06. ^ "Nebula Awards". Ansible. 26. June 1982. Retrieved 2011-09-05. ^ a b c d e f g h i "Nebula Awards 1982". Science Fiction Awards Database. Locus. Archived from the original on 2015-10-25. Retrieved 2011-12-06. ^ a b c d e f g h "Nebula Awards 1986". Science Fiction Awards Database. Locus. Archived from the original on 2015-10-25. Retrieved 2011-12-06. ^ a b c d e f "Nebula Awards 1987". Science Fiction Awards Database. Locus. Archived from the original on 2015-10-25. Retrieved 2011-12-06. ^ a b c d e f g "Nebula Awards 1988". Science Fiction Awards Database. Locus. Archived from the original on 2015-10-25. Retrieved 2011-12-06. ^ a b c d e f "Nebula Awards 1991". Science Fiction Awards Database. Locus. Archived from the original on 2015-09-28. Retrieved 2011-12-06. ^ a b c d e f g "Nebula Awards 2004". Science Fiction Awards Database. Locus. Archived from the original on 2015-09-28. Retrieved 2011-12-06. ^ a b c d e f "Nebula Awards 2005". Science Fiction Awards Database. Locus. Archived from the original on 2015-09-28. Retrieved 2011-12-06. ^ a b c d e f g "Nebula Awards 2006". Science Fiction Awards Database. Locus. Archived from the original on 2015-09-28. Retrieved 2011-12-06. ^ a b c d e f "Nebula Awards 2007". Science Fiction Awards Database. Locus. Archived from the original on 2015-09-28. Retrieved 2011-12-06. ^ a b c d e "Nebula Awards 2014". Science Fiction Awards Database. Locus. Archived from the original on 2015-09-28. Retrieved 2016-02-22. ^ a b c d e f g "Nebula Awards 2015". Science Fiction Awards Database. Locus. Archived from the original on 2015-09-28. Retrieved 2016-02-22. ^ a b c d e f g "Nebula Awards 2017". Science Fiction Awards Database. Locus. Archived from the original on 2017-05-23. Retrieved 2017-05-23. ^ a b c d e "Nebula Awards 2018". Science Fiction Awards Database. Locus. Archived from the original on 2018-05-21. Retrieved 2018-05-20. ^ a b c d e f g "Nebula Awards 2019". Science Fiction Awards Database. Locus. Retrieved 2019-04-07.